Photo: BNP pays last respect to its standing committee member and ex-minister Tariqul Islam at Nayapaltan central office around 9:40am on Monday. Dhaka, Nov 5 : BNP on Monday paid last respect to its standing committee member and ex-minister Tariqul Islam, who passed away at a city hospital on Sunday, by placing wreaths at his coffin. Tariqul’s coffin was taken to BNP’s Nayapaltan central office around 9:40am and kept it on a stage in front of it, enabling party leaders and activists to have a last glimpse of their late leader. 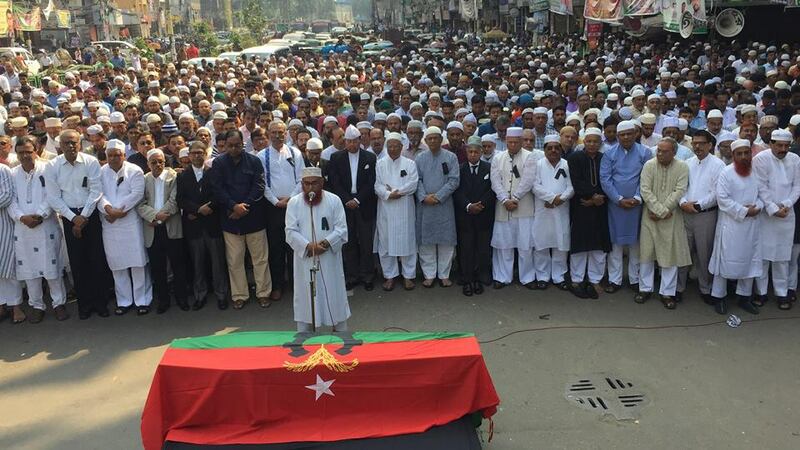 BNP secretary general Mirza Fakhrul Islam Alamgir along with party senior leaders, on behalf of the party, placed wreaths on Tariqul’s coffin and draped it with a party flag as a mark of respect to him. Later, his second namaz-e-janaza was held there joined by several hundred party leaders and activists. BNP secretary general Mirza Fakhrul Islam Alamgir, standing committee members Khandaker Mosharraf Hossain, Moudud Ahmed, Jamiruddin Sircar, vice-chairmen Alataf Hossain Chowdhury, Barkatullah Bulu, Shahjahan Omar, Mohammed Shahjahan, Zainul Abedin, Shamsuzzaman Dudu, AZM Zahid, Ahmed Azam Khan, chairperson’s adviser Amanullah Aman, Habibur Rahman Habib, and senior joint secretary general Ruhul Kabir Rizvi joined the janaza. Tariqul, who had long been suffering from heart, kidney diseases, diabetic and old-age complications, died at Apollo Hospital here on Sunday at the age of 73. Later, his body was taken to South Plaza of Parliament where his third janaza was held. His body will be flown to Jashore and his fourth janaza will be held at Jashore Eidgah ground after Asr prayers and then he will be buried at his family graveyard there. Tariqul had long been inactive in party politics due to his illness. He last attended BNP standing committee members’ meeting in February this year before Khaleda was sent to jail in Zia Orphanage Trust graft case. He was elected MP for four times from Jashore and performed as information and environment and forest minister during the BNP-led four-party government. When BNP formed the government in 1991, Tariqul was first made social welfare minister and then post and telecommunication minister. Born in Jashore in November 1946, Tariqul was the first elected chairman of Jashore municipality.